Mixed Reality is the result of blending the physical world with the digital world. 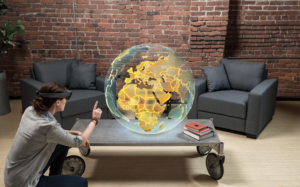 Mixed reality is the next evolution of human, computer, and environment interaction and unlocks possibilities that before now were restricted to our imaginations. It is made possible by advancements in computer vision, graphical processing power, display technology, and input systems. Holographic devices. These are characterized by the device’s ability to place digital content in the real world as if it were really there. 1 Extended reality: MR, AR, VR, What’s The Difference?